Water filter installation is an important step to take if you want the water supply at your home or business to be cleaner, healthier, and have a great taste. Many people buy water filter pitchers, bottled water, or a filter for their kitchen faucet, but this doesn't keep up with the demand for purified water if you have a family or own a business. A kitchen water filter doesn't help with the laundry or the shower. If your water supply has impurities or sediment, this water is not just in your kitchen. It's with you in the shower when you bathe, it's in the clothes you wash in the laundry, and all the other places where you commonly use water. Water that is high in sediments and other impurities can taste bad, cause staining, and possibly make you ill.
Water filter installation, water filter service, and water filter repair can solve a lot of water contamination problems. A whole house water filter can remove the taste and odor of chlorine, and reduce lead, mercury, microbial cysts, sediment, and agricultural pollutants in you water. These pollutants can come from corrosion of household plumbing systems, erosion of natural deposits, decay of asbestos, and run-off from landfills and croplands. A whole house water filter is different because it is located on the main line before it enters your water heater. This means that both the hot and cold water and the water throughout your entire house will be filtered water. Not only will your water taste better, but your laundry will also be cleaner and there won't be pollutants on your skin when you shower. Water filter installation isn't something you should do yourself. Whole house water filter service or even under-sink water filter installation is one of those projects that home improvement centers advertise as being a do-it-yourself project. However, any project where you have to turn off the water supply and cut out a piece of the main supply pipe is not something that you should try on your own. If you look at the directions for a water filter, after you cut out a section of the main pipe you will be installing adapter couplings and compression fittings. Then, you may need to attach the water filter to the wall and make sure that you can get to the filter so you can remove it when it needs changed. The most important part of the process, however, is to check for leaks when you are finished. This is where we come in. Water filter installation that is done professionally doesn't require that you cut up your pipes and hope that you don't have a major plumbing leak when you are finished. Call Smiley Plumbing if you want professional water filtration service instead of just water pipe repair. We can bring the water filter to your home, have it quickly installed and guarantee that your water filter will be working properly for a long time. We also provide professional water filter repair and pipe replacement if you have old pipes that are part of the water problem. 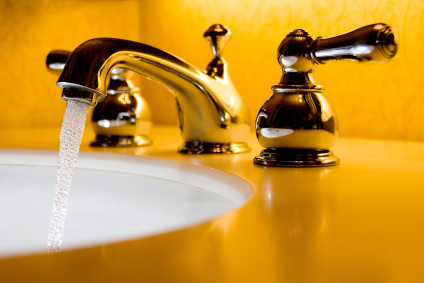 At Smiley Plumbing, we can help make sure that all of the water that comes from your faucets is pure and clean.